Posted on Tue, Aug 6, 2013 : 11:10 a.m.
Isra Kasham got to hold one of the cats rescued from the storm drain at Lillie Park Monday evening. This story has been updated with information from eyewitness Suzette Collins. Two furry felines made friends with firefighters who found the kitties in an unlikely place Monday afternoon — at the bottom of a storm drain in Lillie Park, located at 4365 Platt Road. 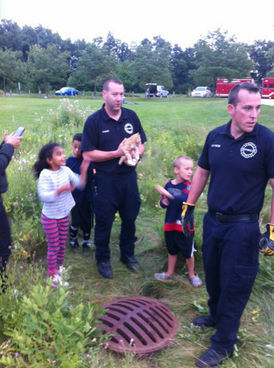 Pittsfield Township firefighters were called to the park in the evening after receiving a report of a kitty trapped in the drain, Fire Chief Sean Gleason said. Suzette Collins, of Ann Arbor, was at the park for one sons' soccer games around 8 p.m. when her 5-year-old son Aiden Schlecht heard a crying kitty, she said. 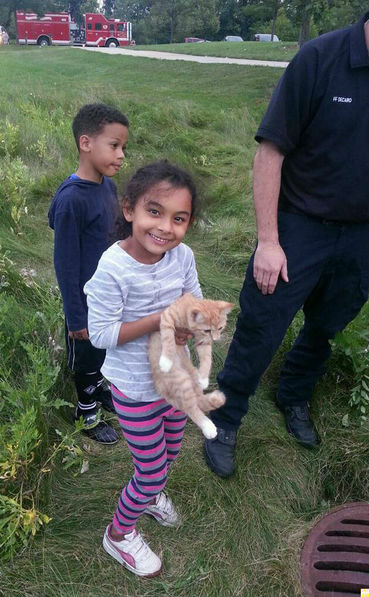 When the 5-year-old discovered the kittens were down a storm drain, he came and got Collins. She called the humane society, which was closed at the time. So she decided to call the fire department, which showed up with fifteen minutes, she said. The firefighters discovered not one, but two kittens had found their way down the drain. The felines were rescued. Pittsfield Township firefighters rescued two kittens from a storm drain at Lillie Park Monday afternoon while children looked on. “The little kids were all around them cheering them on,” Collins said. The children were then allowed to snuggle with and pet the kittens before the firefighters took them back to the department. The kittens were subsequently turned over to the Humane Society of Huron Valley. Gleason said the department receives calls about trapped animals from time to time and that it always responds -- without lights and sirens, however. The calls can be a refreshing change of pace for the department. Many of the recent calls usually involve ducklings stuck in storm drains, he added. No one was sure how the kittens got down there. Wed, Aug 7, 2013 : 8:17 p.m. Even when the Humane Society of Huron Valley is closed to the public, we still respond to calls about animals that are sick or injured, or in this case needing rescue. Our rescue staff is paged when a message is left. In fact, we did call back on this situation but the Pittsfield Township Firemen were already on the scene and helping. Sometimes calls are made to more than one municipality when people are worried and whoever gets on the scene first will help - we all work together. Our rescue team was asked to meet the firemen at the station and get the kittens back to the shelter for care. The kittens are doing very well and in fact have adoptions in progress, and will have caring homes soon. HSHV does not pick-up stray animals. We provide 24-hour rescue for sick and injured animals only. Wed, Aug 7, 2013 : 2:21 p.m. Animal control is often not available, from my experience. We called about an emaciated mama pit bull loose in the neighborhood recently, the Police don't handle it, animal control did'nt have anyone on call and the humane society can't come out same day...so we picked her up and took her there ourselves. I hope others get involved when they see animals/wild life in trouble, if it's safe to do so of course. Fri, Aug 9, 2013 : 9 p.m.
daywell, don't worry about your grammar, and GOOD FOR YOU for actually DOING SOMETHING! My hat is off to you! Wed, Aug 7, 2013 : 2:22 p.m. Wed, Aug 7, 2013 : 1:39 p.m. I'm just sad that no one at the park wanted to give those kitties a home. Hopefully they are adopted quickly. Wed, Aug 7, 2013 : 1:32 p.m. Wed, Aug 7, 2013 : 12:51 p.m.
Great story. Looking that that drain cover makes me wonder how kittens, however small they are, managed to get down there. They look like they are in pretty good shape, so they probably weren't there long, thanks to these good Samaritans and firefighters. I'm sure these precious kittens will be adopted quickly. HSHV is such a wonderful shelter! Wed, Aug 7, 2013 : 1:34 p.m. They probably wandered in at the opening of the pipe on the other end. Likely where the rest of the litter of feral cats resides and where they would have wandered back to without this intervention. Wed, Aug 7, 2013 : 3:38 a.m. Thanks guys! I love it that the kids got to see you being heroes to those little kittens! Tue, Aug 6, 2013 : 11:43 p.m.
Tue, Aug 6, 2013 : 11:06 p.m. They should have called Officer Tackleberry. Tue, Aug 6, 2013 : 8:18 p.m.
Sweet story. This will be a good childhood memory for those kids for years to come--good job firefighters! Must there always be at least ONE nasty, negative individual who thinks these rescues are a 'waste of taxpayer dollars'?! Get a life. Tue, Aug 6, 2013 : 7:14 p.m.
Pittsfield public protectors on Platt plucked from the precipice a pair of purring...cats. Wed, Aug 7, 2013 : 3:40 a.m.
Neat alliteration. NOTE: I recently used that same word in complementing a post on a different thread, and was deleted. Apparently someone thought it was a dirty word. Sigh. Tue, Aug 6, 2013 : 8:06 p.m.
Tue, Aug 6, 2013 : 7:22 p.m. Clever, but you could have used the other p-word too! Tue, Aug 6, 2013 : 7:06 p.m.
Look how thrilled those kids are! And there is something too cute about tough men holding tint kittens! Tue, Aug 6, 2013 : 7:45 p.m.
Tue, Aug 6, 2013 : 6:49 p.m.
As an unapologetic animal lover, I doff my hat to the firefighters who rescued these precious kitties!!! Tue, Aug 6, 2013 : 6:03 p.m. Excellent training opportunity for when/if a person needs to be rescued out of a drain. They are getting paid the same regardless. Nice job. Tue, Aug 6, 2013 : 5:59 p.m.
Great rescue! Those kids will remember that forever, and talk about it for days. When the day comes that they see an animal that needs to be rescued, hopefully this experience will cause them to take the time and make the extra effort. I wonder if there is a nearby open end to that drain pipe? If so, it may be a hazzard that should be closed. Beware of B-movie monsters when looking for the opening. Fri, Aug 9, 2013 : 8:56 p.m.
Tue, Aug 6, 2013 : 11:12 p.m. Impressed that the kids wanted animals they didn't own themselves rescued. That the kittens didn't cut anyone's hands holding them, or act defensively in other ways. Apparently firefighters have authority to contact HSHV with stray animals that ordinary citizens don't. Tue, Aug 6, 2013 : 7:21 p.m.
Tue, Aug 6, 2013 : 7:20 p.m.
No, it's the giant ants. Them! I don't recall the Triffids ever being in the sewers or drains. Tue, Aug 6, 2013 : 6:53 p.m.
Tue, Aug 6, 2013 : 4:43 p.m.
Tue, Aug 6, 2013 : 11:49 p.m. The thing to keep in mind... someone who is lacking in empathy or compassion in such a situation likely has more going on underneath. Just hope that they work out whatever it is. Tue, Aug 6, 2013 : 7:15 p.m.
Tue, Aug 6, 2013 : 6:52 p.m. I agree. I'm also more than a little disgusted/ticked off/nauseated by the negative comments! Tue, Aug 6, 2013 : 4:23 p.m. They also helped teach the children that all life matters. Even the lives of kittens. Good for them. I hope they find good homes. Tue, Aug 6, 2013 : 11:11 p.m.
Tue, Aug 6, 2013 : 9:53 p.m.
Tue, Aug 6, 2013 : 9:49 p.m. Yes, they showed the kids that all life matters. Let's hope they also taught the kids that it is every mama kitty's right to abandon her litter if she so chooses. Let's keep abandonment safe, legal and rare. And let's make every kitten a planned and wanted kitten. Remember to respect your pets' tights and spay or neuter them, if that's what they want. Tue, Aug 6, 2013 : 7:12 p.m.
Tue, Aug 6, 2013 : 4:14 p.m.
Yeah, what a waste of time they should have just sat around the station watching TV or playing ping pong, not! They are getting paid the same regardless of what they do. So they used a wee bit of gas to go a mile down the road, big deal. Tue, Aug 6, 2013 : 3:56 p.m.
Well, I think it's a nice story. Sometimes the fire dept. are the only responders who have the equipment necessary to save an animal - such as a ladder for kitten stuck in a tree. I'm good with the use of their time, but then again, I love defenseless little baby animals. Tue, Aug 6, 2013 : 3:52 p.m.
Tue, Aug 6, 2013 : 3:47 p.m.
What a complete waste of time, resources, and taxpayer dollars! Wed, Aug 7, 2013 : 4:53 p.m.
Way to go. Almost as many votes as were cast in the third ward council race. Wed, Aug 7, 2013 : 2:24 p.m.
Tue, Aug 6, 2013 : 11:46 p.m.
Wow, I think that is the highest down vote count I've ever seen. For good reason. How could anyone not feel empathy and compassion in this situation? There were no other pressing calls for the AAFD. They provided a service to the community, animals were saved, children were cheered up, etc. One of the most common children's motifs of our era has been Fire Departments helping stuck/trapped pets. It's in children's books for a reason. It demonstrates compassion and empathy, thereby inspiring youngsters to consider Fire Fighting as a career. Napoleon, I'm not going to judge your character, but simply ask you to look a little deeper into your heart in regards to this. Tue, Aug 6, 2013 : 8:56 p.m. Firefighters are paid whether responding to a call or sleeping. They arenot paid by the &quot;job&quot; or necessarily for WHAT they do. They are paid the same to put out a trash can fire as they are a blazing inferno in a 10 story building. They are paid as PROTECTION. If there were no fires, the firefighters would be at the station watching TV or napping, but glad you feel saving lives is a worthless endeavor and should not take up anybodies time or effort. It shows what you really are. Tue, Aug 6, 2013 : 7:24 p.m.
With that outlook/attitude, no one will help you when you need it. Karma. Tue, Aug 6, 2013 : 7:03 p.m. Try for the bigger picture, napoleon. Tue, Aug 6, 2013 : 6:50 p.m.
Um, Napoleon, do you see your down votes? why don't you take your hostility somewhere else? Tue, Aug 6, 2013 : 6:05 p.m.
Only waste of time was your post. This could serve as great firefighter rescue training. Feel good story too. Tue, Aug 6, 2013 : 5:20 p.m.
Tue, Aug 6, 2013 : 4:03 p.m.
Other than a little gasoline to get to the site, what was even used? The firefighters were on duty; if there was a more pressing call, they would have responded to it. In what way was anything &quot;wasted&quot;? Tue, Aug 6, 2013 : 3:44 p.m.
A little surprising. My first call would be to animal control. I wonder if people call the Human Society when there is a fire. 2nd smartest city in the country? Yep. Wed, Aug 7, 2013 : 3:30 a.m. The only &quot;Animal Control&quot; service still extant is that provided by the Humane Society of Huron Valley. And they do it well and cheerfully. But as noted, they were closed. Tue, Aug 6, 2013 : 11:04 p.m. I think animal control is for animals inside buildings, usually private ones. But it was great that the firefighters pulled the kittens out ALIVE, so that no decaying bodies could pollute the storm drain. Whoever can get them out alive at whatever time of day, should be contacted. There is no animal control per se. Those are the only two people that should be called. Maybe they can start putting screens/grates on all these storm drains to prevent animals from getting in trouble and trash going in there as well. We have enough pollution in our water system anyway. Viva good Samaritans! Thank you to those involved. Tue, Aug 6, 2013 : 7:19 p.m.
Tue, Aug 6, 2013 : 6:51 p.m.
Eye&quot;heart&quot;A2, is this all you're taking away from this? really?